Please follow all indications to the camper/motorhome/caravan area. It's not possible to park your camper/motorhome/caravan at the camping area. It's not allowed to park your vehicle next to the roads in the environment, you will be fined and the vehicle will be towed away. There's a special place provided for a camper/motorhome/caravan. If you're traveling with a caravan, only 1 car is allowed to enter this area. Extra tents are allowed. Cars without a caravan are not allowed and should be parked at the main festival parking. Small vans (Type: Citroën Berlingo, Peugot partner, VW Caddy, Opel Combo, ...), vans without a built-in sleeping spot (Type: Opel Vivaro, Mercedes Vito, VW Transporter, ...) should be parked at the main festival parking. If you don't know 100%, please contact the organisation @ info@groezrock.be. If you bought the wrong ticket, there's NO REFUND, but you're allowed with that ticket at the main festival parking. It's not allowed to sleep in your car at the festival parking. 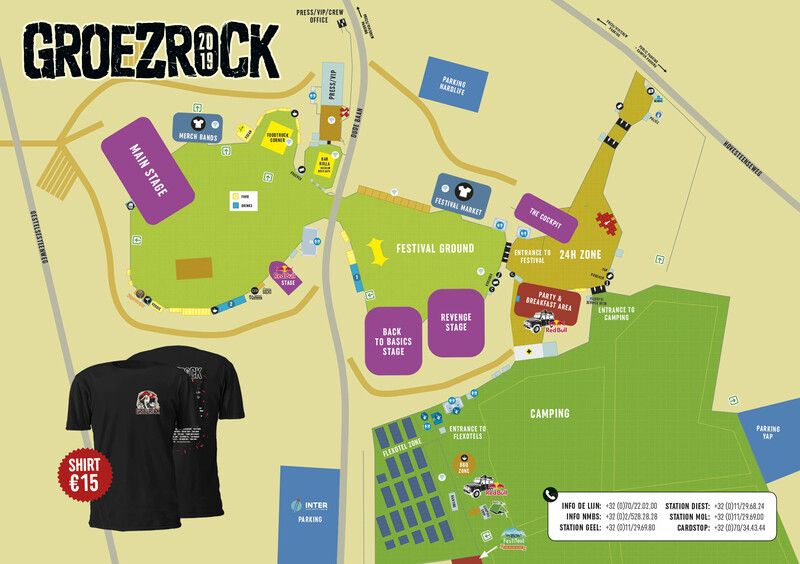 There's no space provided for buses or coaches at the camper/motorhome/caravan area (please check the ‘Coaches to Groezrock' section). Showers, toilets, fresh water (not potable), lights and electricity are available. Remark: If you need electricity, you need to bring your own extension cords (min 25 mtrs). We provide 220V, max 300w (SHUKO 220V monofase). Everyone staying at the camper/motorhome/caravan area needs a camping ticket. If you want breakfast or plan to go to the MONSTER party on Thursday night, you can enter the Camping Area with this ticket. We strongly suggest to order a “Motorhome/Camper/... ticket all days" for your camper/caravan/motorhome/... in advance through our ticket shop. € 20 per person for the weekend. (You're allowed to enter the camping area as well). Make sure you order these camping tickets in advance with your festival ticket. The car should be parked at the main festival parking. Only 1 car is allowed with a caravan, all other cars need to be parked at the main festival parking. BBQ is allowed unless it's an open fire. GAS BOTTLES, What's allowed, what's NOT (download). PA-systems or music installations are forbidden. Bonfires, campfires, torches, candles, fireworks and the burning of your tent at the end of the festival are strictly forbidden. Cans and plastic bottles are allowed. Glass bottles are strictly forbidden all over the camp and festival site. Breakfast with tea or coffee will be served on Saturday & Sunday from 08:00 till 12:00 at the camping area. The camping bar will be open from early morning till late night. No glass objects, no spades, no weapons, no drugs. Small generator units are not allowed at the camper area. No graffitti. Control is very strict. If you get caught, you will have to pay for the damage immediately and head for home. Catapulting any kind of object into the air will result in a fine and immediate removal of the entire festival site. PACK AND GO! Trespassers will be reported to the police. No animals of any kind are allowed on the campsite. Stray dogs will be caught and owners will be fined €125. Refusal to pay: dog will be taken to an animal shelter. Extra costs will have to be paid by the owners. take exit 24 ‘TURNHOUT-CENTRUM' and follow Kasterlee, Geel, Meerhout or take exit 22 ‘GIERLE' and follow Tielen, Lichtaart, Geel, Meerhout. take exit 26 ‘RETIE' and follow Dessel, Mol, Meerhout. take exit 24 ‘GEEL-OOST' and follow Meerhout. At these exits and on main roads there will be indications that will lead you to the festival. GPS address: GROEZROCK - Gestelsesteenweg - 2450 Meerhout.